Paula do Prado is Sydney-based artist whose practice engages with textiles, collage, painting, soft objects and text. Born in Montevideo, Uruguay, Paula emigrated to Australia in 1986. Her work explores identity in relation to authenticity, privilege and belonging. In particular, she draws on her mixed European and Afro-Uruguayan heritage to investigate the politics of experience as a migrant living on stolen land. Intertwining past and present, notions of home and away, real and imagined, her work often uses the decorative including pattern, colour and texture to create multiple layers of meaning. Many of her chosen materials are reclaimed, gifted or collected on her travels and play a significant role in the conceptual narrative of the work. Masks, doll-like bodies and cloth murals emblazoned with text in Spanish and English are recurring elements in Paula’s work referencing the African diaspora and Latin American traditions in protest and resistance art. 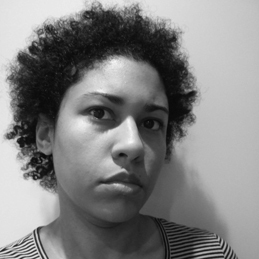 As a woman of colour and feminist, she has a specific interest in retrieving and reinserting invisible, forgotten or otherwise unknown personal and collective histories back into contemporary thought and dialogue. Paula’s works made for Curatorial+Co. are from her series of Hybrid Forms – an ongoing series of experimental fibre studies. Visually the works reference a combination of forms; feminine and masculine reproductive organs, animals (owls, octopi, jellyfish) and ceremonial African masks. Eyes are a recurring symbolic motif as windows to the soul, seeing and not seeing and simultaneously looking towards the past and future. Each work in the series is highly individual and a one-off piece. Paula holds a Bachelor of Fine Arts (Textiles) with First Class Honours and a Master of Fine Arts from Art & Design at the University of New South Wales. She has previously lectured in Textiles at Art & Design and now continues to facilitate a range of independent art workshops in soft sculpture. She has held several solo and groups shows in Australia as well as overseas in Mexico, Brooklyn USA and Brighton UK. Her work is currently included in the State Library of Victoria’s touring exhibition Self Made: zines and artist books.